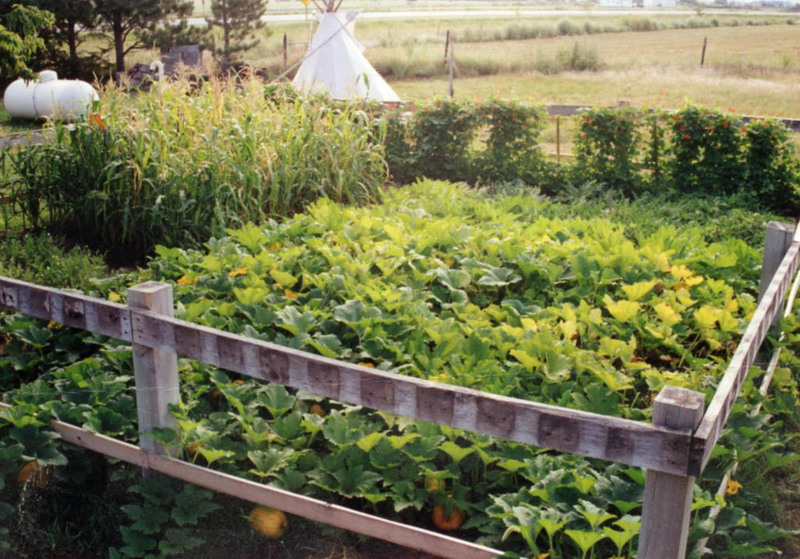 Because American Indian agriculture helped in supplying sustenance to the trading posts and transport crews, the Museum of the Fur Trade maintains a botanical exhibit of authentic growing Indian crops. The varieties that we zealously maintain for future generations to enjoy are the same ones that were grown for centuries by Indians of the Missouri Valley, and now are all but extinct. Oscar H. Will, pioneer Dakota horticulturist, originally obtained most of the seeds directly from the Indians over 125 years ago. The founder of the Museum of the Fur Trade, Charles Hanson, then acquired the seed stock from Will’s son, George. Among the crops the summertime museum visitor can observe are the midget Mandan tobacco that preceded the traders’ carrot of Virginia tobacco, the Assiniboin flint corn that went into the distillery at Ft. Union, and the blue-kernelled “little corn” that James Willard Schultz watched his adopted Blackfoot mother grow on the Montana plains. The museum saves enough of the precious seeds to replant, and any surplus is offered for sale to museum patrons. The following varieties are available on a limited basis. Each ¼-ounce seed packet costs $5 and may be purchased in the Museum Shop. Please note that we cannot ship seeds outside of the US. The traditional soup bean of the Seneca. It is a rapidly growing climber with beautiful red, sweet pea-like blossoms. Makes an ideal fence cover. A mixed flint and flour variety, it is one of the smallest varieties of corn and is ideal for grinding into meal or flour. The fur traders dried this variety for winter provisions. Seeds were presented to Oscar Will by James Holding Eagle, a Mandan in 1907 (80-85 days). Ears the size of a man’s thumb are borne on leafy stalks from two to three feet tall. A small, pink-fleshed, sweet melon that is the descendant of small Spanish watermelons brought by traders from St. Louis in the late eighteenth century. It is an early maturing variety that is easy to grow (80 days). These are small, dark red, flat bush beans. They are great for chili and salads. It is early, very prolific, oblong, orange, and sweet. Dr. Melvin Gilmore originally collected this from the Omaha Tribe in the early twentieth century and the Oscar Will Seed Company began selling this variety in 1924 (80 days). This large blue-green squash is the earliest winter squash; it will continue to grow fruit and out-yield all other varieties, even under drought conditions (about 90 days). This is the earliest squash and was obtained by Oscar Will from the Mandan Indians. It is a small, round, striped summer squash that will ripen anywhere and is drought resistant (about 50 days).